Novel Summary: Chapter XXXVI - Final P.S. By M.T. Chapter XXXVI - Final P.S. By M.T. 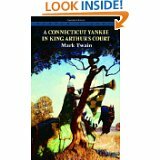 This is a free study guide to A Connecticut Yankee in King Arthurs Court which was written by Mark Twain. Within the story the rivalry between Hank and Merlin is, of course, a humorous aspect to this work. Please click on the literary analysis category you wish to be displayed to help with your study and review of the book. We have chapter summaries as well as in depth analysis of every aspect of the story. Use the Back and Next buttons to guide you through all the sections or you can choose to jump from section to section using the links below or the links at the left.